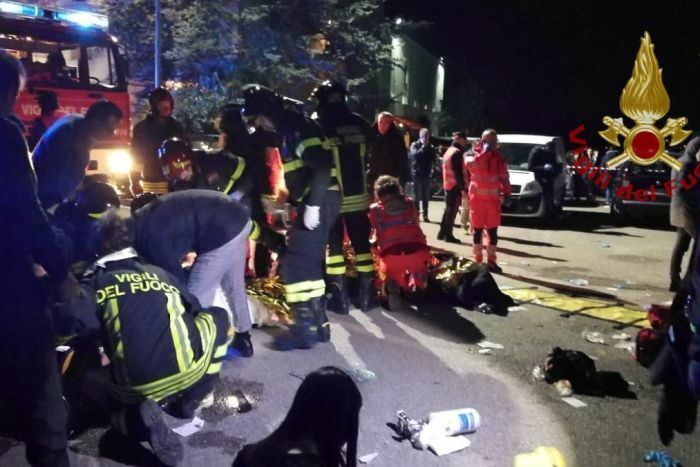 Six people, all but one of them under the age of 18, have been killed in a stampede of panicked concertgoers at a disco in a small town on Italy’s central Adriatic coast, authorities say. Nightclub patrons ran for the exits after someone sprayed a noxious substance similar to pepper spray. Police chief Oreste Capocasa said those killed in the resulting rush to the doors included three girls, two boys and an adult woman — a mother who had accompanied her daughter to the Lanterna Azzurra nightclub in Corinaldo. More than 50 other people were injured, 14 of whom were in serious condition. It was not immediately clear how many people were inside the club when the stampede erupted or what the venue’s maximum capacity is, but RAI state radio reported about 1,000 people were inside. “It was a mess. The bouncers were getting the persons out,” one unidentified witness told RAI state radio. The incident occurred during a concert by Italian rapper Sfera Ebbasta, police said. A 16-year-old boy told ANSA news agency disco patrons were dancing while waiting for the concert to start when the stampede erupted. The boy, who was being treated at a hospital, said at least one of the emergency exits was locked when he tried to flee. The report said authorities were investigating whether the emergency exits were working.